On December 26, 2004, the tsunami disaster triggered by a massive earthquake that occurred off Sumatra Island in Indonesia caused devastating damage to Ache Province on the northern end of this island. Indonesia is frequented with natural disasters, like this tsunami disaster, that occur as a result of crustal movements. It is because the archipelago nation Indonesia is located at the boundary of the Eurasian plate, Indian Ocean Plate, and Australian Plate. Affected by the crustal movements, over 129 volcanoes accompanying active volcanic activities exist in this country, and topography and geology in the non-volcanic areas are also fragile and complex. Accordingly, sediment-related disasters are frequent all over the country every year. To cope with such sediment-related disasters in Indonesia, Japan extended technical cooperation through three sabo projects since 1970 when Tomoaki YOKOTA came to this country as the first long-term expert sent by the Japan International Cooperation Agency (JICA). The three projects are: (1) Technical cooperation on sabo technology through the activities of individual experts; (2) Technical cooperation on volcanic sabo technology through the Volcanic Sabo Technical Centre (VSTC) Project (1982 - 1991); (3) Technical cooperation on sediment-related disaster prevention in the non-volcanic areas through the Sabo Technical Centre (STC) Project (1992 - 1998). Such technical cooperation on sabo technology supported not only the prevention and mitigation of sediment-related disasters in Indonesia but also the promotion of disaster prevention measures in areas of severe volcanic activity, such as Mt. Merapi and Mt. Semeru, through the economic cooperation assisted by the Overseas Economic Cooperation Fund, Japan (OECF). 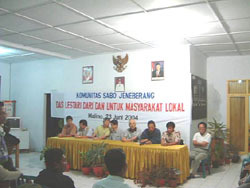 In the Integrated Sediment-related Disaster Management (ISDM) Project (started in April, 2001) now under way as the latest project, activities are being promoted from the following three standpoints to establish a disaster prevention system suitable for the present status of Indonesia (democratization and decentralization), on the basis of achievements of past technical cooperation. In Indonesia which belongs to the maritime tropical climate zone, most of sediment-related disasters occur during the rainy season. Agricultural land and village communities are extended up to deep into the mountains, especially in Java Island and Bali Island having a large population density. Also, land development is going on in the mountainous areas on the outskirts of large cities, such as Jakarta and Bandung, and the population is increasing in those areas. Because of such background, sediment-related disaster information appears in the newspaper almost every day during the rainy season. The number of sediment-related disasters carried in the newspaper was 50 in 2003 and 44 in 2004 (only those appeared in the newspaper). Most of them are related to either volcanic activities or tanah lonsor (which means a landslide in Indonesian: a distinction among debris flow, landslide, and slope failure as a phenomenon is not clear in Indonesian). From among the sediment-related disasters that occurred recently, two cases are introduced below as the typical sediment-related disaster in this country: (1) Large-scale landslide at Mt. 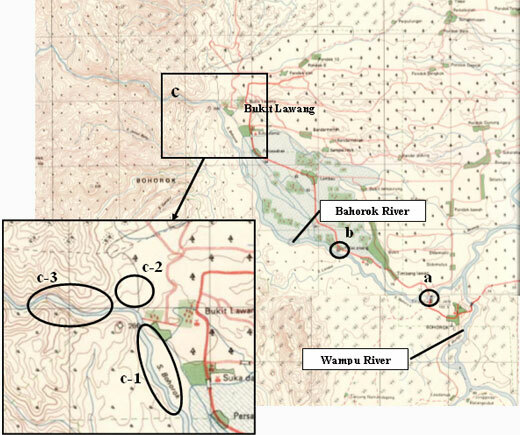 Bawakaraeng in the basin of the Jeneberang River on Sulawesi Island; and (2) Flash flood in the basin of the Bohorok River in North Sumatra Province. On March 26, 2004, a large-scale landslide involving 230 million m3 of sediment occurred at Mt. Bawakaraeng (2830 m) which is the head stream area of the Jeneberang River (total length: 70 km; baisn area: 750 km2) in South Sulawesi Province, Sulawesi Island. 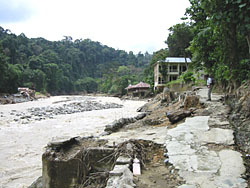 Due to this landslide, Lengkese Village located at the uppermost area of the Jeneberang River suffered devastating damage, including 32 dead and missing, collapse or burying of 12 houses, and 635 deaths of cattle. Such a large-scale landslide was the first experience for most of Indonesian sabo engineers. Makassar (population: 1.2 million), the capital city of South Sulawesi Province, is located at the mouth of the Jeneberang River. 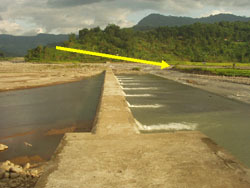 At the point about 35 km upstream from this city (about 35 km downstream from the landslide site), there exists the Bilibili Dam (effective water storage capacity: 350 million m3; used for irrigation, municipal water, industrial water) which is a core facility sustaining the development of South Sulawesi Province. 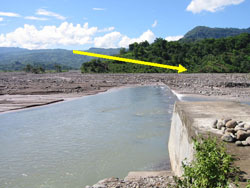 It was feared that the function of this dam might be reduced due to inflow and sedimentation of a large amount of unstable sediment that began immediately after the landslide. The large-scale landslide occurred at the caldera wall (extremely steep wall with a relative height difference of about 500 - 800 m) of Mt. Bawakaraeng. The landslide is divided into Landslide A that occurred in the width of 500 m and Landslide B that occurred in the width of 1,300 m in the area continued to Landslide A. 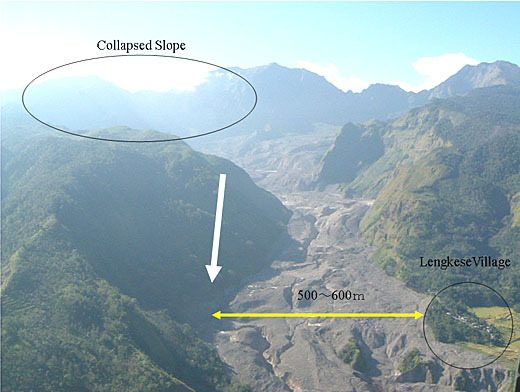 The average thickness of landslide was estimated to be about 150 m in Landslide A and 200 m in Landslide B. The scale of landslide (amount of collapsed sediment) was estimated to be 53 million m3 and 182 million m3, respectively. 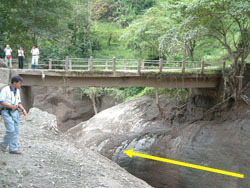 The collapsed sediment became fluidized immediately after the collapse, ran down for 7 km from the occurrence point, and then accumulated in the width of approximately 500 - 800 m. According to a local resident who witnessed the outflow, the collapsed sediment reached a point 6 km downwards in about 3 minutes (He counted the time using a watch), which means its velocity was 33m/s (120km/hr). From the scars and accumulation of sediment, it is inferred that the collapsed sediment flowed down as a debris flow by engulfing air. The direct cause of this landslide has not been determined and the occurrence of an earthquake also not confirmed. 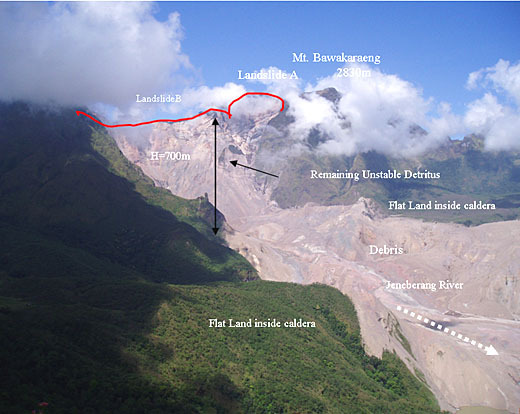 However, it is judged from the slope conditions in the vicinity that the formation of a slip surface due to the downward erosion by the Jeneberang River over a long time had a considerable effect on this landslide. Responding to the call from the Director General of Water Resources Development, Department of Public Works of the Indonesian Government, the ISDM Project immediately carried out a field survey together with the engineers of the Indonesia SABO Technical Centre (ISTC) to grasp the full view of the landslide and to find the necessary emergency countermeasures, and then submitted urgent recommendations. Based on the recommendations, the Indonesian Government requested JICA that an urgent survey team comprised of sabo and dam sedimentation specialists be sent to the landslide site. Then, the JICA Urgent Survey Team (five experts) headed by Shozo KOGA, Director for Volcanic Sabo and Debris Flow Control, Sabo Department, Ministry of Land, Infrastructure and Transport was sent to Indonesia from June 20 to 29, 2004. The survey team conducted a detailed field survey at the landslide site from the professional standpoint. Based on the obtained results, the team submitted the following urgent recommendations on the countermeasures plan to be taken in the coming five- year period, to the Indonesian Government. As the urgent structural measures to control the inflow of a large amount of sediment into the Bilibili Dam, removal of stones in the river channel and construction of sabo dams to prevent the secondary movement of accumulated sediment shall be implemented. As the urgent non-structural measures to prevent secondary damage to local people, establishment of an information communication system (introduction of a telemetering system for rain gauges), establishment of a monitoring system, and preparation of a hazard map, etc. shall be implemented. The cooperation system between administrative organs and local people shall be established. Based on the recommendations from the JICA Urgent Survey Team, the Indonesian Government made an application of loan-based financial assistance to the Japan Bank for International Cooperation (JBIC). It was assessed as the urgent case to be started in fiscal 2005 and a loan agreement was reached in March this year. 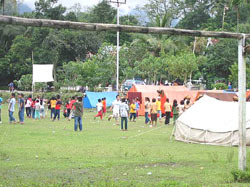 On the other hand, local administrative organs (South Sulawesi provincial government, Gowa prefectural government) formed a “Sabo Community” system in collaboration with local people and local NGOs, and have been conducting monitoring and evacuation drills. The Indonesian Government adopted the basic concept of the ISDM Project as the basic policy for the planning and implementation of the countermeasures plan based on the recommendations from the JICA urgent survey team. Therefore, the ISDM Project provided indirect support to the preparation of a project plan using the JBIC loan. In addition, as the Indonesian Government strongly requested a support from the ISDM Project for the project implementation process as well, it was confirmed at the Joint Coordination Committee (JCC) of the Project in February this year that the landslide site would be adopted as the new model site of the ISDM Project for establishing a countermeasures system after the occurrence of a disaster. In the rainy season this year (Oct. 2004 - April, 2005), the secondary movement of the accumulated sediment began as anticipated. It reached to the Bilibili Dam and the riverbed was aggraded about 5 m on average. The sediment also began to spread into agricultural land along the Jeneberang River. 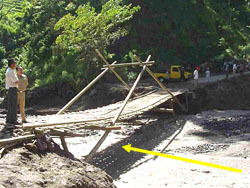 Also, the Daraha Bridge existed on the prefectural road to Lengkese Village (at a point about 3 km downstream from the village) was carried away by the debris flow that occurred on April 17 this year. The riverbed in this area was aggraded about 15 m (as of April, 2005). Thanks to the activities of the Sabo Community, no secondary disasters involving human beings have been caused. But, since a long-term sediment discharge (occurrence of a debris flow) is forecasted, it is necessary to establish a more solid warning and evacuation system. Because no effective and substantial measures were implemented in the rainy season this year, it is strongly desired that adequate and capable measures should be taken before the next rainy season comes. In addition, occurrence of a debris flow is highly likely if the rainy season comes and it may hamper the construction of sabo works at the damage site. It is particularly important to be careful enough about the safety during construction. In October 2003, a large-scale flash flood occurred in the Bohorok River in North Sumatra Province, involving 242 persons killed or missing. (Flash flood means Bangir Bandang in Indonesian.) But, neither the grasp of its actual state, clarification of its mechanism, nor the technical study on the effective countermeasures has been made. 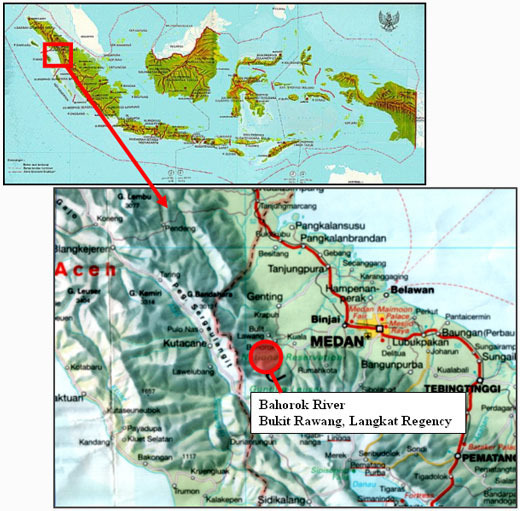 The Bohorok River is located at about 200 km to the northwest of Medan, the capital city of North Sumatra Province. It is a left tributary of the Wanpu River. It has a rectangular shaped basin with a basin area of about 65 km2 and a total channel length of about 25 km. It is a steep river with a gradient of 1/40 - 1/50. The river basin is covered with a thick tropical rain forest and known for the rehabilitation center for orangutans. Hotels and cottages accommodating nature lovers who visit this area are concentrated in Bukit Lawang, a key area in this river basin, which made the current damage severer. When the IDSM Project conducted a field survey (one month after the occurrence of the flash flood), the rainy season was already started and we were unable to cover the entire area of the basin. However, we could confirm the devastation in the upstream area to a certain extent from the images taken from a helicopter which we obtained from a separate source. But, it was not possible to grasp the details of the flash flood, such as the direct cause of it. 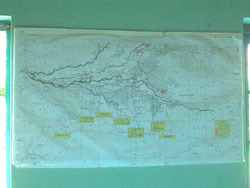 Outline of the field survey we conducted in the Bukit Lawang area and its vicinity as well as in the 3.5 km section upstream of this area is presented below. 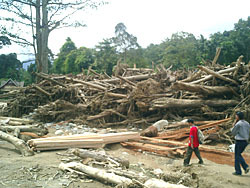 Due to this flash flood, a large amount of driftwood flowed down and accumulated in the Bukit Lawang area, a key place of this basin. In particular, driftwood with a diameter of 1 - 2m, a length of 40 - 50m, and still retaining their roots flowed down from natural forests in the upstream and accumulated over a wide area. Its accumulation depth exceeded 10 m in some places. Since the accumulation of driftwood was so conspicuous, flooding of sediment was not so much noticeable. However, it was found from the field survey that the both sides of the torrent in the upstream mountain were scraped out in a vertical range of 4 - 5 m on average. It was also confirmed from the images taken from a helicopter that a considerable collapse had occurred in the upstream area. From this, it is considered that a considerable amount of sediment was produced in this river basin but its amount is unknown. Immediately after the occurrence of the flash flood, President Megawati of Indonesia made an inspection of the disaster site. The president decided to take budgetary measures for recovery, with the basic policy of relocating affected people in the Bukit Lawang area and restoring a water intake facility for agricultural use. And, officials of the North Sumatra provincial government began selection of an appropriate construction method. But, since they have no experience of such a large-scale disaster before, they were unable to decide the best option by themselves based on the engineering knowledge. Therefore, the ISDM Project presented its survey results to the North Sumatra provincial government and also provided technical advice on the basic matters related to the countermeasures plan whose basic policy had already been established. Since the upstream area was devastated up to deep into the mountains, we advised on the necessity of establishing a warning and evacuation system as the preparedness for the recurrence of a flash flood. The countermeasures are currently being taken by incorporating our advice and no recurrence of a flash food has been reported as of today. In Indonesia, active volcanic activities are continuing in many places and sediment-related disasters provoked by volcanic eruptions are frequent on the hillside of those mountains. Landslide disasters (including debris flows and slope failures) are also frequent in the rainy season. These localized disasters are being prevented by the basic countermeasures endorsed by sabo technology that has been accumulated at the Indonesia SABO Technical Centre (ISTC) through the sabo technical cooperation to date (financial assistance is still needed). In the meantime, both of the large-scale landslide at Mt. Bawakaraeng and the flash flood in the Bohorok River have not been investigated sufficiently in terms of engineering aspects. It is because Indonesian sabo engineers have never experienced such large-scale failures and are overwhelmed by their magnitude, both technical and financial. As the features of these disasters, the following are pointed out. The location of devastation is far away from the location of damage. In some cases, the effect of devastation continues for a long time. Therefore, the scale and method of countermeasures must be considered from those viewpoints. It can be said that these sediment-related disasters are the kind of disasters that cannot be adequately addressed if a comprehensive approach (not a localized approach) considering the entire river basin as a whole is not employed. The dam sedimentation problem is also emerging as the same kind of problem. 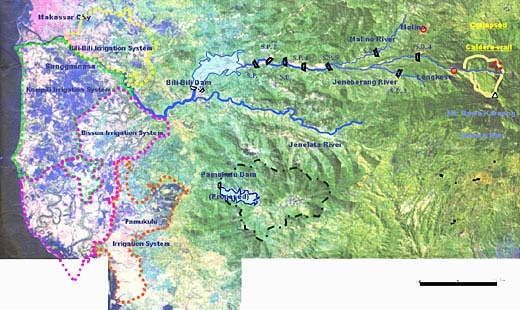 Amid the trend of decentralization, new properties are increasing in the river basins in Indonesia. The situation is the same even in the basins whose head stream lies in the volcanic mountains. To address this problem, a policy of “one plan for one water system” was stipulated in the Water Resources Development Law which was revised last year in the case of water management. But, with respect to sediment management, deliberations have not yet been made. In view of this situation, it is considered that sediment management based on the concept of an entire river basin and the establishment of technology required for that purpose will become increasingly important in Indonesia hereafter.